Woolworths Holdings Limited (WHL) is a South African-based retail group listed on the Johannesburg Stock Exchange since 1997. Woolworths operates in a very congested market. They have competition on the food side from Spar, Pick 'n Pay, Shoprite, and on the clothing front from The Foshini Group and Mr Price. Their net profit margins are however superior to most of these retailers, offering a compelling value investment case before even digging any deeper into their financial results (which we do below). ​Scroll over or click on the funnel chart to get more details of WHL's 28 June 2015 financial results. Woolworths achieved revenue of R58,07billion for the 52weeks to 28 June 2015, compared to R39,94billion for the 52weeks ended 29 June 2014 (revenue increase largely due to the acquisition of David Jones). From the R58,07billion in revenues achieved, Woolies made a profit after taxes and costs of R3,120billion. That gives Woolies a net profit margin of 5.3% and adjusted diluted headline earnings per share of R4,16 a share (putting Woolies on a PE of 22.6). It is a pretty high PE ratio for a food and clothing retailer. But Woolies is strong brand and has a loyal customer base with large amount of returning customers. A good indicator of the type of profits a company generates (paper profits from revaluations, sale of assets, actual goods being sold and cash coming into business) is the cash flow statement. From the cash flow statement it can be seen that Woolies generated R7,3billion in cash from operating activities. 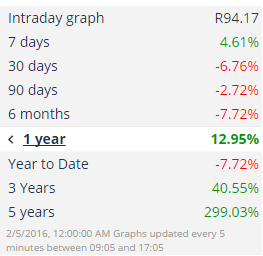 This equates to around R7.80 per share in cash generated. Woolies should no longer be seen as a well known South African retailer. With the acquisition of David Jones and Country Road in Australia, Woolies is now a global player who has a strong foothold in the Australian clothing and retail market. 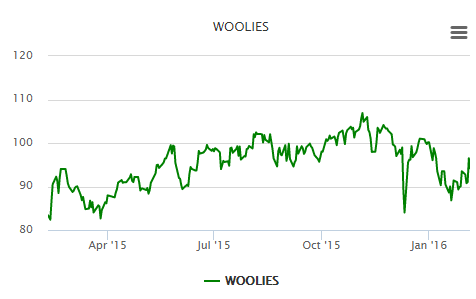 In fact Woolies is fast becoming a good rand hedge. As the pie charts below show a significant amount of their revenues and pre tax profits come from their Australian operations. And with continued Rand weakness, Woolies reported earnings in Rands are set to look extremely impressive over the next 12months. The growth in retail sales reported recently by Statistics South Africa (Stats SA) bodes well for Woolies' results as robust retail sales shows South African consumers have not tightened their belts just yet. The graphic below shows the contributions of their various divisions to their Turnover and contribution to operating profit. The graph is interactive. If you click on any of the division within the pie chart it will shoot out of the pie chart, if you click on the description of the division the graph will either remove or add that division back to the pie chart. If one division is added or removed (it recalculates the contributions and shows it in the brackets). Based on Woolies last set of financial results, their expected offshore earnings and Rand weakness in general (and against the Australian Dollar), and strong brand in South Africa, we value Woolworths shares at between R100.40 and R103.50 each. We therefore feel that WHL is a buy at their current levels and long term investors should look to add WHL to their portfolios and if they already hold WHL, they should look to add to their holdings.